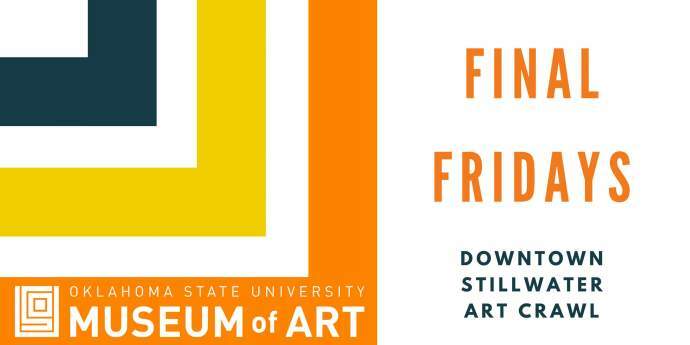 (STILLWATER, Oklahoma / July 20, 2018) — The OSU Museum of Art Student Advisory Committee invites all university students and members of the community to enjoy downtown Stillwater’s growing local business and art scene in our ongoing monthly Final Friday Art Crawl. Beginning at 5 pm on July 27th, students will have the opportunity to experience local social events, art galleries, visiting artists works, and more. 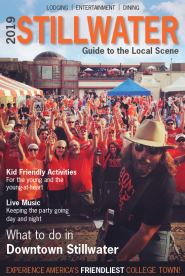 “Hopefully people who don&apos;t study art or who don&apos;t get off campus very often will have fun and realize art doesn&apos;t have to be so intimidating, and that there is more to do in Stillwater than they might think,” said Audrey Gleason, an OSU student and museum intern who helped initiate the event. Although the Art Crawl will not follow a structured schedule, the OSU Museum of Art is suggested as a starting point for picking up a map and viewing the exhibitions and participating in our Film Screening before it closes at 8 pm. Other locations to explore throughout the evening include a Final Friday social event at District Bicycles, and a display of visiting and local artists work at the Stillwater Community Center in partnership with the Stillwater Art Guild, as well as a selection of downtown restaurants and retailers with evening hours. “Another goal for this event is to provide students with an opportunity to spend quality time with each other and develop friendships beyond class, which is so important for our mental health,” Gleason said. Since the first Final Friday event, community engagement with the emerging Downtown Stillwater Cultural District has only grown. This month visiting artists Ken Brown and Josh Stout will be joining us on the crawl, featuring live demonstrations of their woks in both drawing and painting. The Art Crawl is organized and hosted by the OSU Museum of Art Student Advisory Committee, which promotes student engagement with the arts by providing a platform for students to make their voices heard at the museum. By initiating student-led events and sharing their passion for the arts, the SAC shapes the way the museum serves OSU students. The group meets on the first Thursday of every month at 6 pm, starting in September. All meetings are open to OSU students of any major. Check museum.okstate.edu/events for each meeting location. For more information, contact Audrey Gleason at Audrey.Gleason@okstate.edu or join the next meeting on September 6, 2018, at the museum. For more information about the OSU Museum of Art, visit museum.okstate.edu or call 405-744-2780. The museum is located at 720 S. Husband Street in downtown Stillwater. Hours: Tuesday through Saturday from 11 am to 4 pm. Thursday: 11 am to 7 pm. Admission is free, thanks to generous support from the OSU Museum of Art Advocates.